You’ve probably had your fill of skyscrapers and air-conditioned comforts in Singapore. If you’re looking to escape banal urbanity and get in touch with nature or the spiritual, you’re off to a great start. Here’s 6 quiet outdoor places in Singapore to satisfy the contemplative explorer inside you. Picture a deserted beach with corals and little crabs scurrying along the coastline, wind in your hair, salty spray on your face, and a cave that lies hidden among the cliffs for your uncovering. Well, that’s what you’re in for at Tanjung Rimau – a haven from city chaos. Take a five-minute stroll from the edge of Shangri-La’s Rasa Sentosa Resort’s compound, go down a rocky slope and you’ll find the unadulterated beach waiting. Kampong Lorong Buangkok is Singapore’s last kampong (“village” in Malay) standing since 1956. Currently a stone’s throwaway from high-rise flats and bustling traffic, Kampong Buangkok is an odd but welcome respite from the reality of urbanisation. Here, you’ll walk on dirt paths, find rusted zinc-roofed houses, see ‘free-range’ chickens roaming, friendly village folk and the whole rustic-sleepy-town charm going on. Bollywood Veggies is not just a ten-acre organic farm but its also a sanctuary from the hustle and bustle to city dwellers. Reputed as the largest local producer of bananas, you can imagine the variety of fruits and vegetables you’ll find there. Nestled in the Kranji ‘countryside’, you’ll be sure to get all the peace and quiet you seek. Stroll amongst an eggplant plantation, witness adorable pineapple and dragonfruit ‘babies’ emerging from their stalks, take in lungfuls of fresh air and let lush greenery refresh your senses. With a handful of activities you can add to your itinerary, such as paddy planting, cooking lessons, and a museum tour among others, you’re in for a fruitful date with nature. When you’re done exploring, you can conclude your trip with delicious green eats at the farm-to-table concept bistro, Poison Ivy. Take an interest in the history of Singapore and Japan’s relations? This remnant and reminder of the Japanese occupation in WWII is not to be missed. Established in 1891, the park was burial ground for Japanese merchants, prostitutes, soldiers, and convicted war criminals after the Japanese surrendered in 1946. The place was gazetted as a memorial park by the Singapore government in 1987 and holds almost 1,000 graves – a third of which belongs to karayuki-san (Japanese prostitutes). Here, you’ll be able to find a stone garden, prayer hall, and gravestones and memorials constructed by prisoners of war for deceased generals and soldiers. The park is currently in the care of Lim Geok Qi, a caretaker who lives on the cemetery land and who serves as a guide for park visitors. Welcome to the largest mangrove forest in Singapore. If you’re looking to experience mudflats, a sprawling coastal forest, rich flora and fauna, mudskippers and diverse creatures, it doesn’t get any better than Sungei Buloh wetlands. Come on a weekday and you’ll feel as if you have the entire reserve to yourself, where you’ll be treated to a still quietness save for the chirping of birds and rustling leaves. With up to seven kilometres worth of walkable trails, you have plenty of opportunity to connect with nature and find yourself. 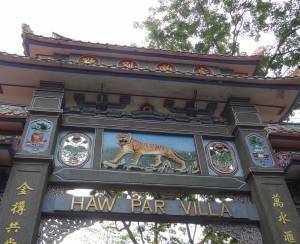 Contrary to its name, Haw Par Villa probably isn’t what you imagine it to be. Bearing similar themes to Dismaland’s disturbing dioramas, Haw Par Villa is like a graphic amusement park that leads you on a journey to discover Chinese mythology and hell (based loosely on buddhist beliefs). Created with the intention to impart Chinese cultural values hinged on morality and spirituality to society, the makers never did spare a single detail. Be prepared to walk through thousands of plaster statues depicting Chinese deities, battle scenes, brutal torture, eerie lighting and a taste of traditional Chinese surrealism. While the graphic nature of the exhibits doesn't exactly qualify the park as a peaceful place, you’d still be able to find some peace and quiet spending time by the bridges, pagodas or with the turtles by the pond.